Hundreds of teams have participated over the past week in the PUBG MOBILE GCC Cup online qualifiers, but only the best teams will advance to the next stage, which will see the biggest Arab competition in the popular title PUBG MOBILE . The qualifiers took place from November 2nd to 4th of this year where we witnessed hundreds of teams from the Gulf region show a strong performance with 12 teams leading to the next stage of Global Final whih will take place in Dubai, United Arab Emirates on Nov 29th-Dec 1st, 2018. Are you a PUBG MOBILE player? Are you from the Gulf region? It's never too late to show your skills and passion! The GCC Cup walk-in tournament will be held at 4:00 PM, Nov 9 th at Dubai City Walk and 8 more teams will be selected to join the GCC Cup final on Nov 10th. The winner from the GCC Cup will be rewarded with cash and a brand new Samsung Galaxy Note9 as prizes and 2 qualified teams will receive the full-paid trip ticket to PUBG MOBILE STAR CHALLENGE Global Finals by the PUBG MOBILE team. PUBG MOBILE GCC Cup winners will be eligible to represent the Arab region at the PUBG MOBILE STAR CHALLENGE Global Finals. 20 teams from around the world will battle it out for a huge $600,000 prize pool at the end of November. 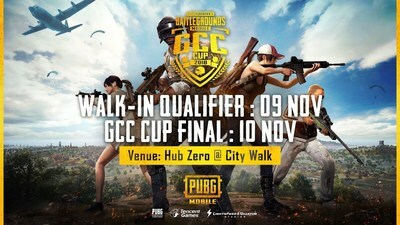 Those not intersted in attending the match can drop by and watch the very first PUBG MOBILE GCC Cup in the Gulf region, meet YouTube superstars and enjoy the event. We will be waiting for you at the Hubzero, so do not miss the chance to attend.